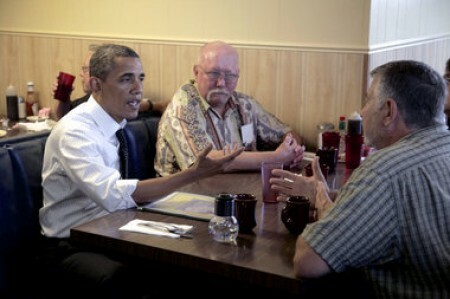 PORTLAND, OREGON – June 24, 2012 – President Barack Obama visited Portland Tuesday greeting diners Mark Peterson, center, and Thomas Foeller, right, at the Gateway Breakfast House in an unschedueld stop on the way to fundraisers at the Oregon Convention Center. Michael Lloyd/The Oregonian. The three veterans were not regulars. They just happened to be sitting in a booth at the diner when Obama popped in. 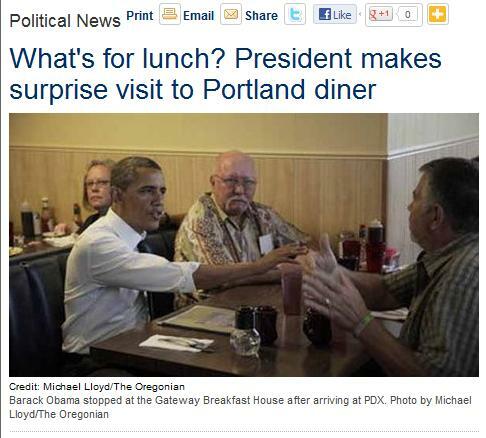 Oregon Live also covered the “unscheduled stop” at the diner. In fact, the Obama Campaign even had a copy of their bios on hand. And, one of the veterans just happens to be an Obama for America volunteer! Dean enlisted in the U.S. Army 1972 when he was 20 years old. He served for three years, from 1972-1975 as a supply specialist. He retired from American Honda Motor Company in 2009, where he worked as a stock and material handler and is currently a volunteer for Obama for America. Dean says that health care is the issue that is most important to him, particularly as he is getting older. He is also focused on veterans-related issues and says he is grateful for the President’s commitment to supporting veterans like himself.